Tel Aviv, Israel – Propel, the PR productivity platform, has released research that shows reporters are 90 percent more likely to open a PR pitch sent between 12-1 PM rather than 9-10 AM. The second most effective hour to pitch is 6-7 PM, when pitches are 40 percent more likely to be opened than those sent between 9-10 AM. The findings shatter a common misconception that pitching reporters first thing in the morning is a best practice. Pitches sent Monday through Wednesday are almost double as likely to get a response than those sent on Thursday or Friday. Interestingly, Thursday is the second most active pitching day of the week (25 percent of the week’s pitches), despite reporters’ low engagement with Thursday pitches. The Propel study additionally reveals that 54 percent of email pitches are not opened at all. For pitches that are opened by journalists, more than half are opened within the first hour of receipt, and 80 percent are opened at some point the same day. 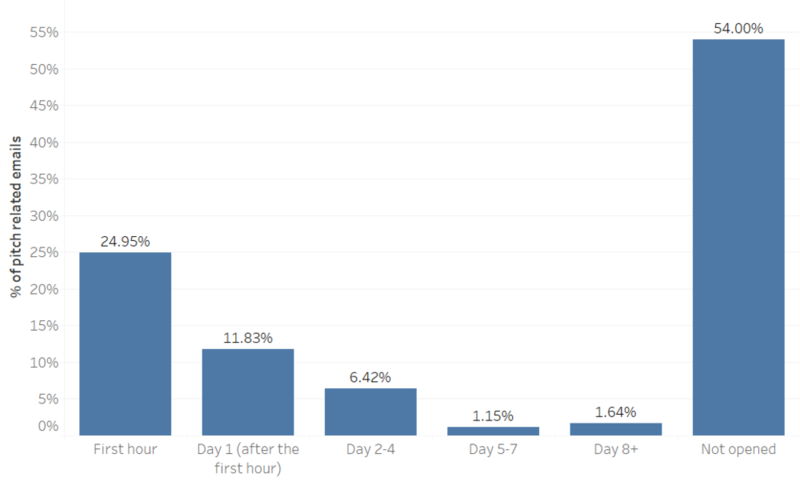 After the first day, without following-up, the odds of a pitch being opened plummet to less than one in 10. This graph shows how long it takes reporters to open pitches. The Propel pitching effectiveness study is based on 2,150 unique PR pitches emailed to reporters in 2019 across dozens of users from a variety of PR agencies. PR agencies have a very bright future to look forward to. The sector is growing at breakneck speed, and will be worth $20 billion by 2020. The importance of communications and media is growing continuously. In terms of public relations - the mediums, methods, and opportunities are at a level we’ve never seen before. And yet with all these changes, the earned media sector, which usually comprises at least 50% of a PR agency‘s efforts, hasn’t innovated at nearly the rate of owned media and paid media. Thousands of platforms, from giants like Google to an abundance of startups, comprehensively address the needs of the paid and owned media industries. Marketing and advertising have become such data-driven and technology optimized disciplines that they are hardly recognizable from what they were a decade ago. The earned media sector, on the other hand, has largely not changed in the last five decades. The legacy database offerings serving PR agencies haven’t undergone the same sea-change of innovation that their brethren in the paid and owned media sectors have--though that is starting to change. More surprisingly, nine out of 10 agencies I speak to don’t use a CRM to manage their thousands upon thousands of reporter contacts and hundreds of media lists. Rather, all of this lives within Excel or Google Sheets for the vast majority of agencies today. Strikingly, though, most agencies do use a CRM to manage their business development efforts - even though the volume of new business leads can’t compare to the number of influencers being handled. Imagine a digital ad firm not using analytics to understand which ads are performing best. Or imagine a content studio lacking tools such as Hootsuite or Contently - which significantly streamline their workflow and help them accomplish more and understand what’s resonating. The good news for PR agencies is that a new product category that can materially improve their workflow and results has emerged: PR productivity technology. PR productivity technology is set to transform the industry, much like the effect Salesforce, Marketo and Hubspot had on the marketing and sales industries a decade ago. PR productivity tools enable agencies to manage all of their contacts and workflows smartly, under one roof, while giving invaluable insights and data points into what’s working and where to hone in efforts. Imagine having the ability to see the firm-wide correspondence with a single reporter or outlet. Having that knowledge is priceless in helping firms manage each reporter relationship in a more strategic way. What if PR teams could have the open, response and publishing rate - at the individual level, the firm aggregate, and the global average - for every journalist? PR productivity technology puts this powerful benchmark in the hands of PR firms to understand how their pitching scores up against the wider averages, and whether a strategy shift or tweaking is necessary. Think about the benefits of having practical pitching tools like mail merge, templates, and scheduled follow-ups right within Gmail and Outlook that enable you to email reporters in less time, while still personalizing and customizing each message to the same degree. 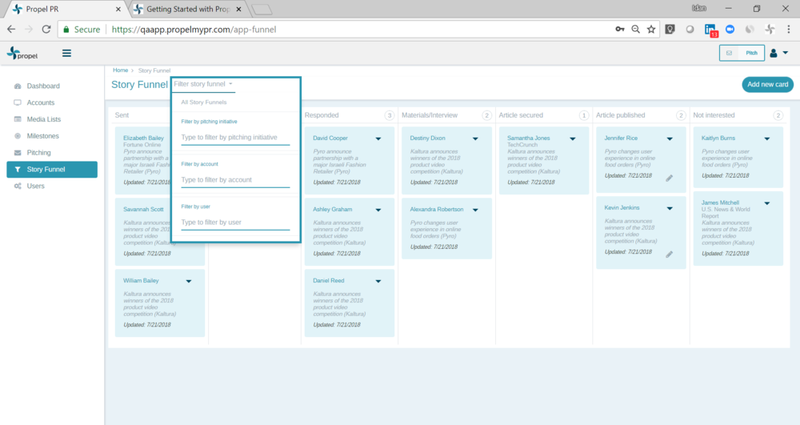 Visualize a kanban board where you can see the real-time status of every media opportunity in your pipeline, and the ability to know who opened your email and when. How nice would it be to create an activity report 10X faster? Or have real-time reports that show you pitching volume and effectiveness across every campaign, account and team member? All of these benefits are available to PR agencies today through PR productivity tools. The best part is that all of these small efficiency improvements together can lead to significant uptick in earned media results, client satisfaction/retention, and profitability of PR agencies. To learn more about Propel, the leading PR productivity platform, click here to schedule a demo. Great PR firms set themselves aside from mediocre ones through one key financial metric: profitability. High profitability means things are running well - clients are happy, employees are performing, retention is strong and the ratio of staff expenses to fee income is healthy. PR firms with 10-15% profitability are doing okay. Those with 20% profitability are very healthy. And the fortunate few who make it to 25% or higher profitability are killing it. For such firms, each dollar the firm collects in fees can be broken down by 50 cents going towards labor, 25 cents going towards overhead, and the remaining 25 cents being profit. Firms with this level of profitability do so well because they can invest significant money back in the business to grow, improve technology, roll out new services, expand geographies, and hire the best talent. This investment reinforces their advantage and the cycle continues, allowing the firm to further set itself apart from competition and strengthen its core. I sold my firm, Cutler PR, one year ago and so I am quite familiar with the immense importance of profitability in PR agency M&A discussions. Firms with 25% or higher profitability are much more likely to get acquired for healthy sums of money. For example, if an agency has 25% profit margin, their value to acquirers will likely be 1.25X annual revenue or 5X EBITDA. So, for all of these reasons, and more, increasing profitability of your PR agency is probably the most important thing you can do as a senior executive or owner of the firm. There are few things, though, that agencies can actually do to increase their profitability. One important measure that can be taken is investing in tools and technology that improve productivity. A majority of PR firms find that the most unpredictable and challenging service they offer is media relations. It is therefore particularly in this area - earned media - that new and innovative technologies can help firms make a significant difference in their profitability. Earned media productivity technologies allow firms to increase their client load by 10-15% without hiring additional resources. And that doesn’t mean burning out your existing team members! Because we all know that is not worth it. Rather, the increase in client load without hiring more people is possible due to the automation, workflow management and efficiency that these technologies bring to teams and individuals. You can simply accomplish more in less time and with less hands on board. Because 50 cents of every revenue dollar goes towards labor costs for most firms, being able to increase client load by 10-15% means increasing annual profit margin of your media relations revenue center by 5-7.5%. If your media relations revenue center is currently generating 10 cents per dollar, this means an earned media productivity platform can help you half again or nearly double your profit margin to 15-17.5 cents per dollar. If your media relations revenue center is generating 20 cents profit per dollar, you can increase that by 5-7.5 cents per dollar, thereby reaching 25-27.5 cents per dollar. That means an increase of a quarter to over a third in your profit margin, simply by adopting earned media productivity technology. This means that if your firm has a 20% profit margin and $5 million in annual fee income for media relations services, earned media productivity technology can help you generate anywhere from $250,000-375,000 in additional profit per year due to increasing account load by 10-15% without having to hire additional staff. Earned media productivity tools additionally help firms increase client retention by 2-4% annually, which boosts profitability further. If your firm has 50 clients, a 2% increase in client retention means holding onto an additional client per year that would have otherwise been lost to attrition. Likewise, a 4% increase in client retention means holding onto an additional two clients per year. If your average monthly retainer is $15,000, this means $180,000-360,000 in additional revenue per year due to increased retention. When combining impact from account load increase and client retention increase, a $5 million revenue firm can collectively generate an additional $430,000-735,000 in profit annually. To sum up, adopting and earned media productivity tool can help your agency increase profitability by 25-75% per year. These increases in profit can be a total game changer and take a firm from mediocrity to excellence. Investing in any technology has some upfront education and learning curve. The payoff, though is remarkable. To learn more about Propel, the earned media productivity platform, and how it can transform your firm’s profitability, please schedule a demo by clicking here.. The public relations industry has come a long way toward being more accountable, efficient, and productive. As someone who has worked in the PR industry for over a decade, I’m very proud of the progress that has been made so far. In the past years, various tools, methodologies, and best practices have been developed by people who were passionately dedicated to the craft. And yet, it is my belief that we could be doing more. I believe that all industries, PR included, must innovate. Today, we must utilize big data and the technology at our disposal to deliver maximum value to our clients if we wish to remain relevant over the next hundred years. Unlike advertising which has been disrupted by digital technology with the advent of Google AdWords, Facebook advertisements, martech platforms, and more, PR has always been relatively soft when it comes to technology adoption and the ability to gain insights and optimize efforts based on data. The power of data has transformed nearly every industry on earth, making businesses more efficient, productive, and better able to serve their customers. The outcomes of PR campaigns may be hard to track (although not totally impossible), but the processes of PR are not. As PR pros, I believe we have a responsibility to ourselves and to our clients to know if our workflow, methods, resources, and employees are operating at peak efficiency. If the above seems frustratingly vague I understand. Rest assured, comprehensive data analytics and management tools like Propel, a CRM designed specifically for PR firms, turn that vagueness into measurable goals, metrics and KPIs. More importantly, these platforms can give you the data and insights you need to make better decisions and ultimately become a more capable and responsible PR professional. There are many areas of PR where it would help to know the data, but the first place where you’d probably want to apply data-driven tactics is your pitch process. The work of generating positive media coverage is fundamental to PR. A tremendous amount of effort goes into outreach and cultivating relationships with reporters. But, if you don’t have accurate ways of measuring the returns of your efforts, much of that time will be spent unproductively. Furthermore, you’ll have no way of knowing what actions are a good use of your time and what tactics amount to nothing. Open Rate: How many email pitches are opened by targeted reporters? Response Rate: How often do reporters respond to your emails? Secure Rate: How often does actual coverage result from these interactions? Allocation of resources: How many employee-hours is it taking to achieve these results? Numerous data-measurement opportunities exist in PR. The above mentioned ones are only the tip of the iceberg. There is so much more that’s possible once the industry takes advantage of the transformative power of big data, AI, and machine learning. Click on the "Story Funnel" tab to see your entire pipeline of opportunities, broken down by pitches "sent," "opened," "responded," "materials/interview," "article secured," "article published," and "not interested." Click on the reporter's name to see their profile page – which includes your entire history of communication with them, their contact info, and any notes you may have. Click on the "Add new card" button on the top-right to create an opportunity that was initiated off-line. You can filter the funnel by user, account, or pitching initiative. To update a status of an opportunity, simply drag and drop from one column to another. You can also click on the arrow in the top right corner of the card and select which column you want to move that card into. After an article publishes, update the card status to "Article Published" – at which point a pop-up box will appear. Fill in the URL and publishing date so that the article will be added to the dashboard and reports. Phew, that's it! You are ready to start pitching and managing your team's PR efforts with Propel. If you have any question or would like to schedule a training session to learn more advanced tricks, please reach out to me at idan@propelmypr.com. 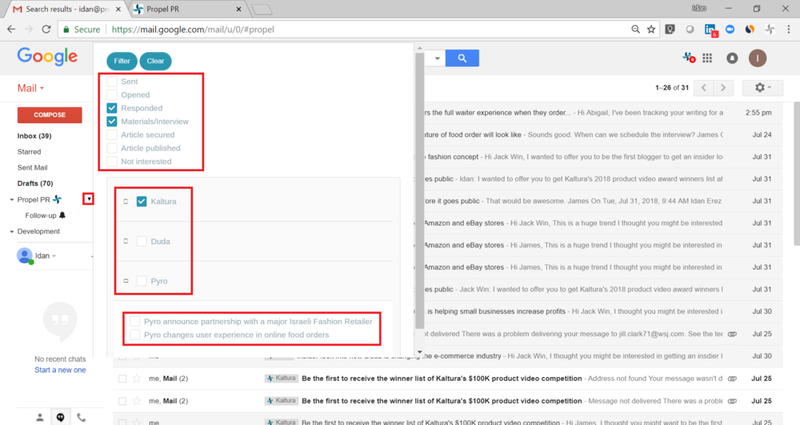 Find the media list you want to start pitching by either filtering by account or searching by media list name. Click on the numbers to open the media list and on the pencil to add contacts from the database. NOTE: numbers represent the total contacts that were already pitched out of the total contacts on the list. Find the contact you want to pitch using the sort and/or search bar. Filter contacts to see just the ones that are assigned to you, not already pitched, etc. Remove contacts from the list or assign users to pitch them. Pitch by clicking on an envelope - your email client will be opened. * If you are using Gmail and it doesn't automatically open, we recommend reading the following tutorial: Mac users, Windows users. First, go to the Accounts section and click on "Add New Account". Enter basic information about the account. If you are in a hurry, you can click "Finish" after completing only the few required fields. If you have a few minutes, it is recommended to complete the next steps in order to get the most out of Propel. Enter website and social media links for the account. NOTE: Although these fields are not mandatory, Propel uses them in order to identify backlinks in articles published when calculating the Propel Factor and SEO Value. Therefore, in order to get the most out of Propel, it is recommended to at least enter the account's website address when setting up the account. Assign existing users (i.e. team members) or add new users to the account. By adding users to an account you give them access to see data and activity related to that account. Complete the "Audience" screen by entering the business type, relevant industries, and media outlets of interest. If you don't know which media outlets are most relevant, or you prefer to not complete this field, Propel will still work fine. However, the more information you enter here, the more LORA – Propel AI Engine will be able to help you by making intelligent recommendations for which reporters to pitch. Enter any key messages related to that account. Messages should be a few words. For example, if you are representing a ridesharing app, a sample message may be "sharing economy transportation is more affordable." Then, add any one-two word tags related to that account. In the ridesharing example, sample tags may be "urban transportation," "sharing economy," "smart city," "on-demand transportation," etc. Propel will use this data to help you build media lists more efficiently and to evaluate the quality of your coverage. Finally, you can add a logo for the account. Click finish when you are done. Congrats – you have created an account! You can edit any of this information at any time, by clicking on the account name and editing any of the steps. If you have any question or would like to schedule a training session to learn more advanced tricks, please reach out to me at idan@propelmypr.com. Click on the "Pitch" button on the top right corner of your screen. This will prompt you to create a "Pitching Initiative", which is a specific campaign/pitching effort within an account. For example, this may be a news announcement for a specific account, or a bylined article. It could also be a specific newsjacking effort, a trend story pitch, or a variety of other activities. Give the pitching initiative a name, enter which account it is for, and choose the type. In addition, you can pick a publishing deadline for time sensitive announcements or you can select "No Deadline Required" for ongoing/evergreen initiatives. Select any key messages that are relevant for this pitching initiative, or add new ones. This is optional. It enables Propel to help you evaluate pitching initiative effectiveness later. Set milestones/tasks for the pitching initiative. This list is automatically generated based on the pitching initiative type you selected and you can add/remove stages based on your preference. NOTE: This is an optional task management feature that allows managers and team leaders to set deadlines and assign responsibility for the various stages within a pitching initiative. Enter any specific search phrases relevant to the pitching initiative, which will allow Propel to help you discover relevant reporters for this pitching initiative. You can also enter which tier levels you are interested in getting coverage in for this pitching initiative. Both of these are optional. Lastly, choose whether you'd like to copy an existing media list or create a new one. If you're just getting started with Propel, you will want to create a new one. You are ready to go - click "Finish & Go to media list". We are really excited to introduce you to Propel! We built Propel to improve the lives of media relations pros. We are media relations experts that have worked in PR for years and chat with hundreds of PR firms to learn the problems they are facing and help them improve their agencies with technology. 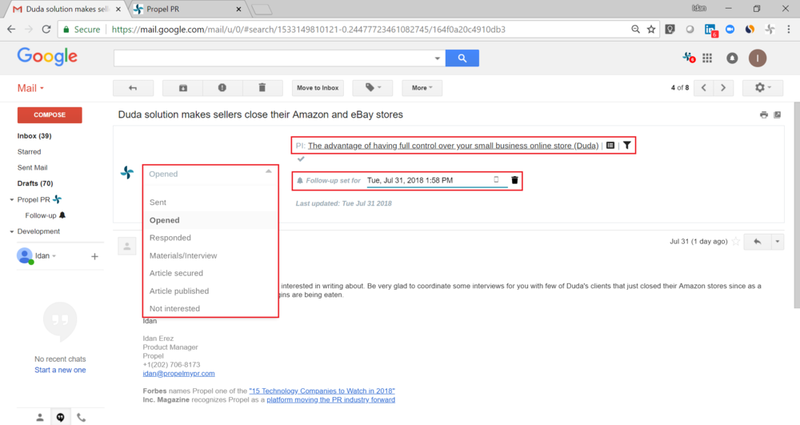 First, you'll want to download our Gmail Chrome Extension. If you don't use Gmail, don't worry! You can still use Propel – you'll just need to set up DNS records. We are deeply excited to be named one of the "70 Israeli Startups You Need to Follow" on Israel's 70th anniversary of independence. Israel boasts one of the most powerful tech ecosystems in the world, and Propel is honored to be part of it. Click to see the full list.